Industry 4.0 will be placed at the centre of Yamazaki Mazak’s EMO 2017 stand with the unveiling of the company’s iSmart factory concept along with 25 new machines, including 15 making their world debuts. The iSmart factory concept utilises Mazak’s Industry 4.0 infrastructure which enables machine users to make the vital step-up from automated cell manufacturing to a completely connected Industry 4.0 factory of the future. Mazak’s iSmart Factory is centred on three key pillars, namely SMOOTH Technology, the new SmartBox, which provides faster data analysis with increased security; and the MT Connect standard communication protocol. All elements combine to facilitate the real-time sharing of manufacturing data between the production floor and offices, ultimately resulting in shorter lead times, reduced in-process inventory and lower indirect labour expenses for manufacturers. SMOOTH Technology, incorporating the world’s fastest CNC and Smooth Process Support factory management software, sits at the heart of Mazak’s Industry 4.0 infrastructure, due to its ability to reduce machining by 30 per cent, connect entire machine shops and provide real-time monitoring and analysis capability. In addition to the SMOOTH Process Support modules, such as SMOOTH Scheduler and SMOOTH PMC, the CNC has also been equipped with a number of new programmes which will be launched at EMO 2017. The first is Mazak API (Application Programming Interface) which enables non-Mazak software, such as automation equipment, to be integrated into the full suite of SMOOTH CNC’s. Alongside this is the new Smooth Spindle Analytics software, which provides instant spindle vibration reporting and analysis. Efficient and secure data processing is made possible by Mazak’s new SmartBox. Utilising Cisco’s FOG computing concept, the SmartBox effectively extends cloud computing closer to where the data is produced. This enables sensitive data to be analysed and acted upon securely with optimal speed, with only selected data sent to the cloud for historical analysis and long-term storage. Cybersecurity is maximised by a state-of-the-art Cisco networking platform and Layer3 Managed Switch, industrialised for the factory environment. The SmartBox can interface with any machine fitted with an MT Connect adaptor regardless of manufacturer, age or CNC type. Older legacy machines can also be connected to the SmartBox with the addition of Mazak’s new SensorBox. The final pillar of Mazak’s iSmart Factory concept is the use of the MT Connect standard communication protocol, which allows the cross-communication of multiple different machines in the factory or workshop, and enables machine information to be extracted in a standardised format. During the exhibition, each of Mazak’s 25 machines, configured into six different machining zones, will be connected using the company’s Industry 4.0 infrastructure to display real-time production information. 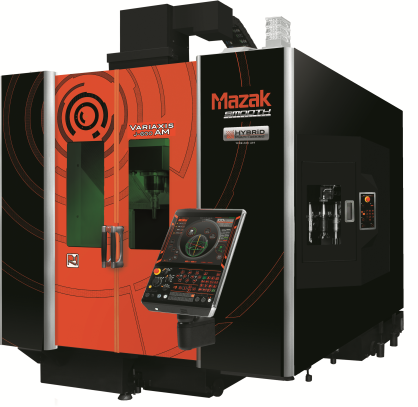 Taking centre stage in the Multi-Tasking zone is the latest extension to Mazak’s flagship INTEGREX range, the INTEGREX i-500 extends the capacity of the successful i series and features a modular design concept, enabling customers to match the required machine specification to their application. The INTEGREX i-500 will be joined by another machine shown for the first time, the INTEGREX i-800V/8, which combines full 5-axis milling, powerful turning operations and pallet-changing capabilities to quickly process large, highly complex parts, such as jet engine components on a vertical platform. Both machines are making their world debuts at EMO 2017, and will be operating on Mazak’s SmoothX CNC, with stand visitors able to witness the level of productivity that can stem from full integration into the iSmart Factory concept. Mazak’s 5-axis zone will be centred on three exceptional new machines. The new HCR-5000S, which is making its world debut, is a compact high performance horizontal machining centre ideally suited to the aerospace sector for the manufacture of small-size structural components. The machine is equipped with a high performance main spindle and is capable of ultra-fast acceleration with excellent jerk control, to deliver highly accurate finished parts. Alongside, in the 5-axis zone, the VARIAXIS i-300 AWC is a compact automation solution developed from Mazak’s highly successful VARIAXIS range combined with automation knowhow from their PALLETECH solutions. The machine incorporates a gantry-box structure to delivery high accuracy and an expandable tool magazine of up to 505 tools, making it ideal for high mix, low volume production and lights out machining. The 5-axis zone also includes a brand new specialist die and mold machine, the UD-400/5X, which is capable of 42,000 rpm, 1.0G acceleration and an ultra-high jerk rate. In the horizontal zone, amongst the stand-out machines is the HCN-5000, equipped with an MPP500 automation system. The 16 station MPP, which stands for Multi Pallet Pool, is designed to add automation to single machines. It features the SMOOTH MPP software application with advanced scheduling functions, analysis of production results and system utilisation which can also be accessed remotely on PCs and smart phones. The space saving design occupies a smaller footprint than the traditional PALLETECH system and is ideal for long periods of unmanned running. One of the highlights in the turning zone will be Mazak’s QUICK TURN 250M. With an automated robot system, seamlessly integrated with Mazak’s SmoothG CNC, it enables complete control of the manufacturing cell from the CNC, as well as real-time data sharing and analysis with the wider factory. The easy-to-programme robot cell enables a flexible, high productivity automated solution, ideal for small to medium lots sizes, suitable for a range of applications. In the vertical machining zone, the highlight is the UK-produced VCN-530C, which is equipped with a newly designed 18,000rpm high-speed spindle, ballscrew cooling on the X-, Y- and Z-axes and a high capacity 40-tool magazine. The machine is specifically targeted at the sub-contracting market. Also in the vertical machining zone, is the VTC-760C. Equipped with Siemens Sinumerik 828D control, machine performance and data can still be analysed as part of Mazak’s iSmart Factory concept through the use of MT Connect and SmartBox. 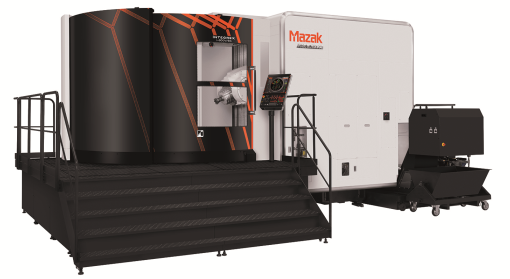 The final highlight for visitors to the Mazak stand will be a first European showing of its latest additive manufacturing machine tool, the VARIAXIS j-600AM. It is the latest addition to Mazak’s growing additive portfolio available to customers in the European market, and the VARIAXIS j-600AM employs an innovative Wire Arc-type metal deposition system to take the additive process to an as yet unseen level of speed. It enables manufacturers to quickly and easily grow part features, and then employ the machine’s advanced 5-axis multi-surface subtractive capabilities to produce high-precision parts complete in single setups. The VARIAXIS j-600AM also benefits from a 12,000-rpm spindle combined with a rotating B and C axes trunnion table. It is well suited for a wide variety of applications, including the production and repair of parts for the aerospace and oil & gas industries.